The Bluesky Healthcare Tilt in Space chair is perfect for people with hip and back flexion problems. 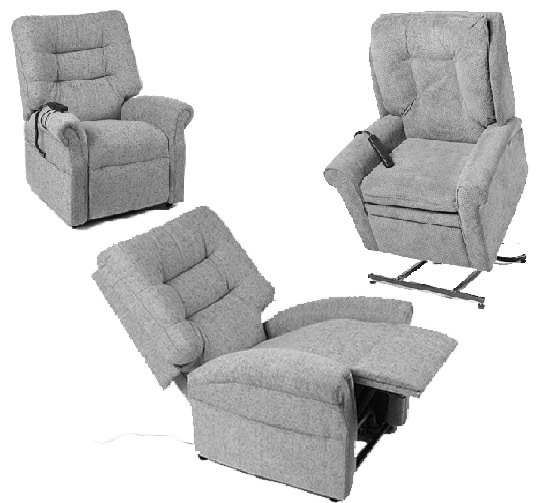 As the chair reclines, the leg rest moves up to support the legs from behind the knees, while at the same time the backrest begins to recline. To allow conformity of body position the recline action is in one continuous movement so that the reclining occurs as a tilt in space action. 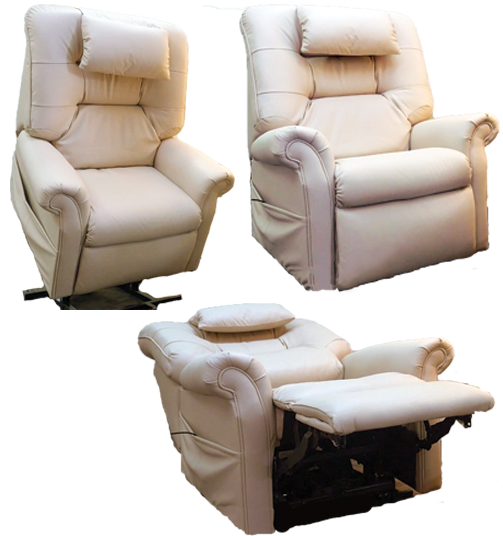 The flow of the chair allows the leg rest to raise substantially above the hips while the backrest reclines to 40 degrees. The Tilt in Space is available in the one frame size -medium. All Tilt in Space Lifting Chairs is custom made to order, which will ensure that the chair is precisely right for you. 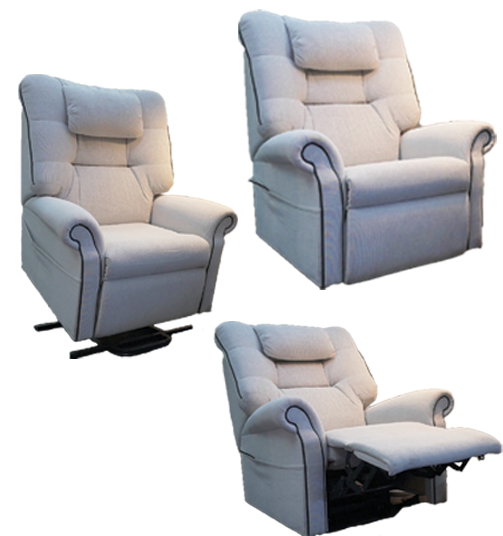 The Chairs are manufactured locally here in Western Australia and come with a comprehensive 5-year warranty on the motor, frame, upholstery and padding. 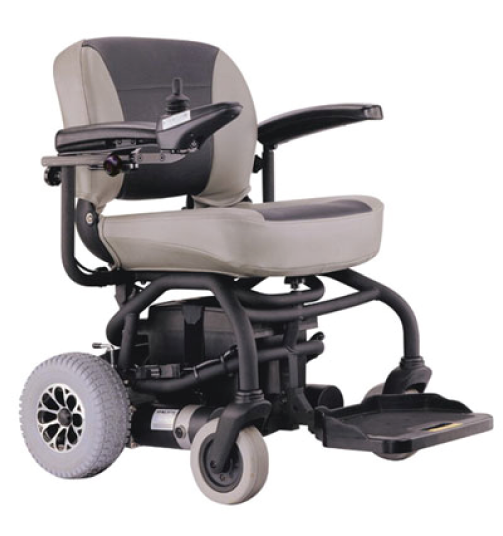 The motors used to lift the chairs are of high quality and operate at a very low noise level, allowing for a smooth and comfortable adjustment. Having a custom-built chair allow you to choose from many different materials including leather and high-grade commercial materials. Regarding design, you have many choices. You can make your chair the feature piece of furniture in your room or design it to blend in perfectly with your existing lounge suite and decor. Let your imagination run wild! To ensure you get the perfect fit, one of our highly trained consultants will measure you and your seating position, alternatively, we always recommend to consult a Professional Occupational Therapist (OT), who can give you medical advise and further assess you. Due to the nature of our business we are used to working very closely with OT's and other healthcare professionals, so you will receive a seamless service. The Tilt function is aimed at clients who can't or struggle to independently shift their body weight. When you can't independently adjust your position or shift your weight while seated in an upright position, you are at a high risk of skin breakdown. You will also find that your usual sitting tolerance is compromised due to the inability to shift and redistribute pressure. This is where a Tilt in space function can assist you with change your position and shifting weight whilst remaining in a comfortable and secure position. Through redistributing your weight you also reduce the risk of sores and skin breakdown. The reason why it can be hard to maintain a good posture is partly due to gravity. Whilst sitting in an upright position such as a chair, gravity pushes down on the body and caused the pelvis to slide forward if your muscle strength or overall strength is lacking. By using the tilt function the force of gravity is used to keep you seated in a correct position in your chair.